Bamas Quarterback, Brodie Croyle, was named the 2006 Outstanding Offensive Player. 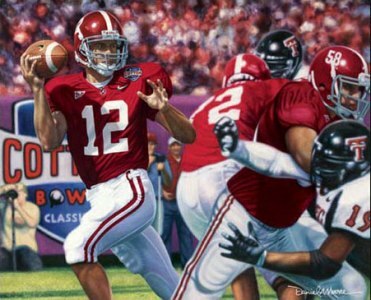 "The Last Pass" features Croyle in the 2006 Cotton Bowl and commemorates his years as Bama's Quarterback. All prints, unless noted, were printed in the US. All frames, unless noted, are custom works made in house. All sales come with a 30 day guarantee. We strive for 100% customer satisfaction; however, if for any reason you are not satisfied with your purchase, you will have 30 days to contact us to arrange for return. Shipments can only be made within the United States.